Controls Punch: A and Y Buttons and up and down on the Control Pad. Guard: L and R Buttons. Dodge: Left and right on the Control Pad. Dream Boxing is a Dream Event that appears exclusively in the Nintendo DS version of Mario & Sonic at the Olympic Games. It is set in the Fighting Arena. The aim of the event is to knock out the opponent. It is unlocked by placing first in the Meteorite Circuit. In this event, the player initially competes against a random opponent, and depending on their placement in that match, will either proceed to a championship match between the two winning characters or a third place match between the two losers. Each match consists of up to two timed rounds, depending on whether a character gets knocked out in the first round. In each round, both characters have a Health Meter, which is shown on the top screen. The aim of the event is to deplete the Health Meter to cause the other character to go down. 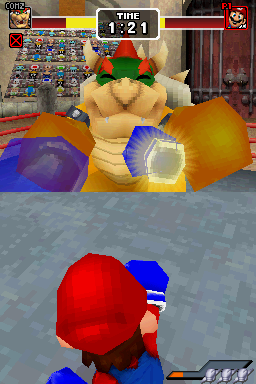 The player is able to do this by landing punches on the other character. They can perform a straight right punch by pressing , which can be powered up to a right hook by pressing up on the control pad or a right body blow by pressing down, and a left jab by pressing , which can be powered up to left hooks and body blows using the same additional commands. Over time, the Special Meter on the Touch Screen will fill, and will grant the player the ability to perform up to three Special Punches by pressing . Each character has their own unique special effect for the punch, though they all perform the same function identically. If the opponent's Health Meter is full enough, they will be able to also press to enter a showdown mode, where , , or must be pressed repeatedly to allow the character who pressed the most times the fastest to punch. Alternately, the character performing the punch may be able to perform it straight away or have it blocked by the opponent. A successful Special Punch will cause the other character to immediately be knocked down, regardless of their current Health Meter level. The player is also able to block other punches by pressing or to guard, or by pressing either left or right on the Control Pad at the same time as their opponent punches to block and counter their attack. If the Health Meter entirely runs out, the player will be knocked down and must repeatedly press to fill a heart gauge that will allow them to get up and begin fighting again, refilling half of their Health Meter. During the time that they are down, their opponent will also be able to heal slightly. It gets progressively harder to recover the more times the player gets knocked down. If they fall down three times or do not press the button enough times within the ten seconds allowed, they will lose the match, allowing the other character to win. Use the buttons to play this event. There are two basic punches. If you press the +Control Pad while punching, you can make more powerful punches. Hold down the L Button (or R Button) to guard, and protect yourself from you opponent's punches. Press the +Control Pad left or right in time with your opponent's punch to dodge it and get a chance to counter. When the Special Meter is high enough, you can unleash a powerful Special Punch with the X Button. The Special Meter can build up enough to allow you to unleash three special punches. Entering a Special Punch results in an input showdown with your opponent. Follow the on-screen instructions and try to enter commands faster than your opponent. You go down if your Health Meter falls to zero. Press the A Button repeatedly to get back up. You lose if you go down a total of three times. Mario: Mario's fifth mission is to counter punches five times. Sonic: Sonic's fourth mission is to perform nine successful sways. This page was last edited on February 3, 2019, at 21:02.